Canadian riders won four of the eight FEI classes offered at the Wellington Dressage CDI-W presented by The Dutta Corp at the 2013 Adequan Global Dressage Festival. The CDI-W was held at the Stadium section of the Palm Beach International Equestrian Center (PBIEC) show grounds January 31-February 3, 2013. David Marcus of Campbellville, ON, kicked-off the winning streak with victories in both the Grand Prix and Grand Prix Freestyle riding Deborah Kinzinger Miculinic’s 13-year-old Danish Warmblood gelding Chrevi’s Capital (Chrevi’s Cavallo x Weinberg), scoring 70.340% for first place in the Grand Prix test on January 31. Riding his new freestyle for the second time in competition proved to be quite successful for Marcus on February 1, when he won the Grand Prix Freestyle with an impressive 74.450% from the international panel of judges. The musical score was composed by legendary designer Joost Peters of The Netherlands. Other Canadians competing in the Grand Prix included Jaimey Irwin of Stouffville, ON riding Lindor’s Finest, a 16-year-old Canadian Warmblood gelding sired by Eastern Ruler and owned by Sylvia Carlton and Ute Busse. In the Grand Prix test, the pair earned a score of 66.809% for fourth place and 68.175% for fifth in the Grand Prix Freestyle. Diane Creech of Caistor Centre, ON, rode Douglas Leatherdale’s Devon L, a 13-year-old Hanoverian gelding (De Niro x Wolkenstein II) to sixth place in the Grand Prix with 65.319% and fourth place in the Grand Prix Freestyle with 70.175%. Cheryl Meisner of Chester, NS, earned seventh spot,in the Grand Prix with 64.511%, and second place in the Grand Prix Special with 67.875% riding her long-time partner Paganini, John Risley’s 16-year-old Dutch Warmblood stallion (Havidoff x Statuar). Canadian Olympian Jacqueline Brooks of Cedar Valley, ON, rode her Olympic mount, D Niro, Brookhaven Dressage Inc’s 14-year-old Swedish Warmblood gelding (D-Day x Napoleon 625) to a third place finish in the Freestyle, scoring 70.250%. Meisner also rode Tango, a 13-year-old Dutch Warmblood gelding (Obelisk x Lohengrin) she co-owns with Risley, to sixth place in the Freestyle with 66.000%. In the FEI Junior classes, Naima Moreira-Laliberté, 16, of Outremont, QC, won both the Team test (66.324%) and the Individual test (67.053%) riding her 12-year-old Hanoverian gelding Diamond (Donnerhall x Werther). Laurence Blais-Tétreault, also 16, of Montreal, QC, was second in both classes, scoring 65.595% in the Team test and 65.158% in the Individual riding Lowelas, her 13-year-old Trakehner gelding (Hockey 41 x Inster Graditz). The international judging panel at Wellington Dressage CDI-W included Canadian Lorraine MacDonald (4*), Wojtek Markowski (POL 5*), Anne Gribbons (USA 5*), Jennifer Loriston-Clark (GBR 4*), Sandy Phillips (GBR 4*) and Janet Foy (USA 4*). 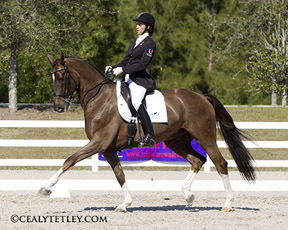 The next stop for Canadians competing down south is CDI1*/3*/J/Y/P/U25 West Palm Beach, FL, being held February 7-10, 2013.